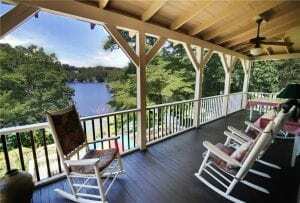 Reminisce about the good ole days while rocking in a warm gentle breeze overlooking the calm Lake Lure water. This cozy vintage style cabin is perfect for a vacation, second home and/or rental. Tongue and groove pine walls, real wood burning fireplace and screen porch add to the traditional feel of vintage Lake Lure. A fire pit surrounded by lush greenery overlooks the lake. A full length deck adds extra entertainment on one of the two boathouses on the property. Only 5 minutes to downtown Lake Lure!! A golfer’s paradise awaits in this incredible home on the 17th green in Apple Valley Golf Course. The private wooded setting opens to the lush greens awaiting your hole in one! Inside you will find the kitchen has a gourmet layout with lots of cabinets, a butcher block island and built-in gas grill. Professional appliances can be easily added for a more updated style. A private hot tub just off of the master bath completes the dream of a golfer’s retreat. Who could ask for a better deal? Affordable, well-built and unique! This home is also part of Rumbling Bald Resort. WHAT A VIEW!! This inspiring home built high above the trees has gorgeous panoramic views as far as the eye can see. Home has impeccable detail including large stone fireplace, a masterful open floor plan and guest suite. Tatanka is Lake Lure’s hidden gem in the mountains with some of the best homes and sites around! Our featured “Extraordinary Home ♦ Extraordinary View” this week is a stunning lakeside gem with immaculate views in every corner. Sit on the sundeck and enjoy front row entertainment as the birds soar over the mountaintops, mother ducks teach their brood of ducklings, and an occasional deer peeks through the bushes for a sip of water. Enjoy morning tea or coffee on the main level deck as you start your day. The views are spectacular! Watch as the sunlight sparkles on the lake and the mountains paint their reflection on the water. Wave at the boaters as they cruise around the waterway, and the fisherman as they row home with the day’s catch. As the sun begins to sink, relax at your lower patio and watch the picturesque lake through old world inspired archways. On rainy days, sit in the cozy sunroom and gaze outside your big bay windows as approaching storms light up the mountains and raindrops dance along the lake. No matter what the day brings, you can always come back home to your own paradise in the mountains. Don’t escape the world, embrace it! Our featured “Extraordinary Home ♦ Extraordinary View” this week is a sophisticated masterpiece built in 1986 by Climis and Carol Lascaris. Combining elements of Old World Charm with luxurious details, “The Palace” captivates you and the moment you walk in the door you can feel the special memories of the past whisper from room to room. This unique property features not one but two homes, each with their own distinct character. The original house (base for the guest house) was purchased by Louise Matthews (Carol’s mother) after their 1st visit in 1979 – she saw the view and had to have it. Wrote a check on the spot. The A-frame section and the deck were added later. . The Lascaris family, who are world renowned interior designers, later decided to design and build their house in the mountain (a larger home on the same site) – it took three years to build because they could not use dynamite to remove the rock. It was dug and chipped out by hand. Imported marble has been laid throughout the entire home. Floors, countertops, showers and fireplaces shine with rich blends of intricate design. The home was acquired by a new owner several years ago and due to unforseen circumstances have not been able to utilize and maintain it to its full potential. This offering is a great opportunity for someone with creativity and vision to restore the homesite to its original grandeur. As for the view…..well let’s just say it is one of the most spectacular of the entire Hickory Nut Gorge area. As far as the eye can see left all the way to the right, over 220º stunning views of the Rumbling Bald Mountain chain. Inspiring peaks, steep cliffs and massive boulders can be seen from nearly every room in the house. Watch as hawks and eagles circle and soar the landscape and song birds sing their morning tunes all while in the comforts of home! Our office has closed over $6.5 million in real estate just this month! Spectacular mountain home constructed with outdoor entertaining in mind. From the stone walls surrounding the paver driveway to the meticulously landscaped grounds with cascading waterfalls to the porte-cochere and stone foot bridge that leads to the artisan-crafted outdoor kitchen with authentic Italian pizza oven and outdoor living room all surrounding a beautifully constructed 3 bed, 3.5 bath residence with screen porch,views and guest quarters.